These purses are made from vegetable tanned goat and calf skins that have been dyed using period dyes and they are made entirely by hand. 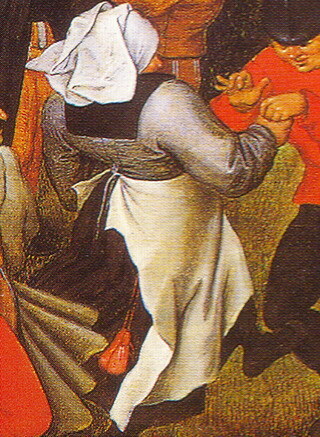 This design is based on a figure in 'The Peasant Dance' by Pieter Bruegel painted in 1568. They hang from a leather cord and the side seams are bound with a contrasting coloured leather. The front and back of the main section is made from calf leather to help them keep their shape and there is a wide side gusset which gives them lots of room inside. They have a useful extra pocket on the front held closed with it's own drawstring. They measure 9 inches wide and 6 inches long (23 x 15 cm) when open.